I'll always remember that cool autumn night in Prague when the rain-slicked street glowed a soft red from the Bohemian Café's neon sign. I knew I'd feel better once I'd had my fill of the warm, heavy Czech fare awaiting inside... wait, scratch that, it was Omaha, Nebraska, not Prague, but that's just a technicality. 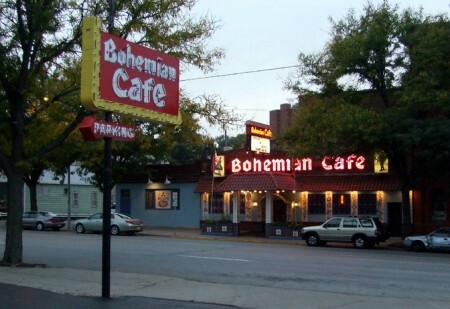 The Bohemian Café has been warming the hearts and stomachs of Omahans in one semblance or another since 1924. The café was originally owned and operated by chef Louie Marcala and sold to the Libor family in 1947, then moved to the current location in 1959 in Little Bohemia (next door to the historic 1898 Prague Hotel). As soon as you pass through the front door, the first thing that catches your eye is the curved wood and glass cabinet that shows off the café's massive collection of whiskey decanters stretching up to the ceiling. Not having been to the Czech Republic, I couldn't tell you if the decor was typical, but it definitely bore the appearance of a family-style restaurant - tables covered with vinyl red-and-white gingham check (not Czech) tablecloths and paper placemats; condiments provided in commercial style packets. I'm not sure if it was because it was a rainy night or that the room was dimly lit, but it would almost have been romantic if I weren’t there alone. Most of the pictures on the walls depicted Central European scenery, except for a large portrait hung front and center that featured Josef and Ann Libor. 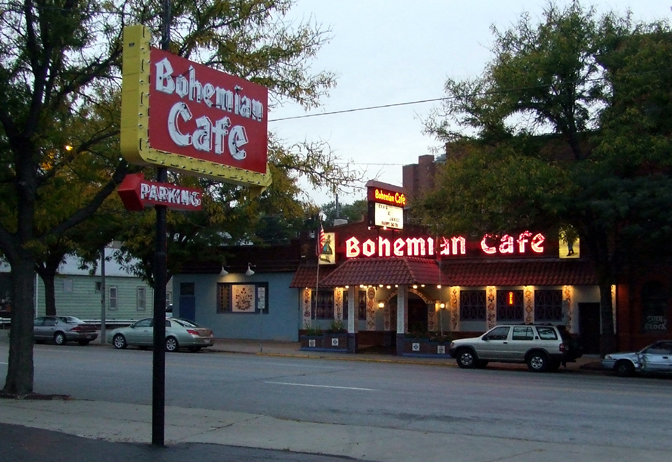 The Bohemian Café was recommended as an Omahan favorite, and I was looking forward to trying their Czech cuisine. I brushed past the standard fare of steaks, chicken and seafood as I scoured the menu looking for the real deal. As soon as I saw "liver dumpling or soup of the day", I wondered how anyone could choose Door Number 2. 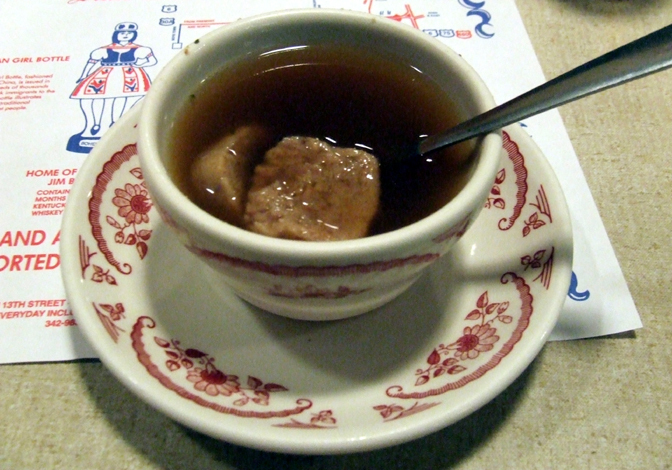 The soup featured a strong, slightly salty beef broth with several cubed beef liver dumplings swimming inside; each bite of the dumplings was savory heaven. As a main course, I selected the only logical choice - breaded sweetbreads (which probably sounds redundant to those picturing baked goods). The sweetbreads came with a choice of one from Column A (vegetables, sauerkraut or sweet and sour cabbage) and one from Column B (Czech dumplings, whipped potatoes or French fries) again with the Trippy Food choices being obvious (we'll see if you guessed correctly). 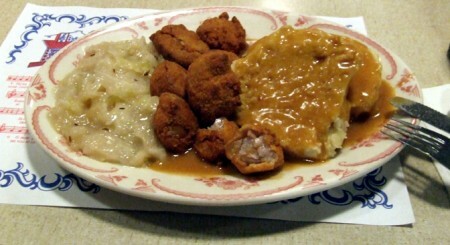 The entree arrived on a patterned china plate that would probably have looked comfortable in a Prague café; neatly arranged in thirds was the sweet and sour cabbage, followed by the breaded and fried sweetbreads, and then flanked by a palm-sized Czech dumpling smothered in a brown sauce. Although the cabbage was cooked down to mush, it was neither too sour nor too sweet and maintained a strong cabbage taste. The dumpling was bready and moist; it was the perfect substitute for potatoes. The tangy brown sauce complemented the dumpling well and added flavor to the cabbage and sweetbreads, which is a good thing since it appeared as though the sauce levy had broken open on the plate. The sweetbreads themselves were delightful; the centers were still a little pink, but hot and not too chewy. The breading was crunchy and golden brown, neither soggy nor overdone and mopping the sauce with them only enhanced their flavor. I considered a Bohemian dessert, but after engorging myself on the plate of rich food I had only enough room left for a cup of coffee (which, with the hot, hearty food was the perfect antidote for the rainy October evening). There were very few people dining that evening and I wondered if that was common; Omaha is a rapidly growing city and it wouldn't surprise me to find that people are flocking to the newer trendy restaurants and clubs that are popping up like dandelions. This entry was posted in Trippy Food (Tasty flora and fauna), USA and tagged Bob Kerrey Pedestrian Bridge, Bohemian, cabbage, cafe, Czech, dumpling, Hotel, Iowa, Libor, liver, Louie Marcala, Missouri River, Nebraska, Omaha, polevka z jatrove knedlick, Prague, soup, sour, sweet, sweetbreads. Bookmark the permalink. Those offal dishes look awfully good! Glad I Czech-ed in on your latest post.